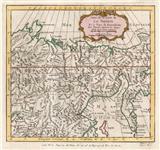 Description: RARE map of Eastern Russia. Caspian Sea and Central Asia from the famed Rome edition. Description: Ptolemaic map of part of modern Asiatic Russia, including the Sakha region. Taken from the Treschel edition, woodcut by L.Fries. Description: Ptolemaic map of Central Asia east of the Caspian Sea, including Kazakhstan, Uzbekistan, and Turkmenistan. This region was historically known as Scythia, Sogdiana, and Bactria after the nomadic groups who inabited the region. From Laurent Fries' 1541 edition of Ptolemy's "Geographia". Description: Uzbekistan, Turkmenistan, Iran, Azerbaijan, Georgia and the Caspian Sea, with part of Russia. Decorative cartouche and original hand colouring. Description: Beautiful copper-engraved map showing Captain Vitus Jonassen Bering's first expedition across Siberia fromTobolsk to the Kamchatka Peninsula, a distance of over 5,000 miles. Whimsical decorative cartouche. Description: Siberia, charting Russia's 17th century exploratory routes through the Sea of Okhotsk and across the East Siberian Sea, with an expansionist aim to claim Kamchatka. Coloured. Description: Map of explorered regions of Siberia to Kamchatka by Danish explorer Captain Vitus Bering (1681-1741) during the First Kamchatka Expedition (1725-39) and the Great Northern Expedition (1733-43) during which the "Bering Strait" was named in honour of him. Description: Uzbekistan, Southern Kazakhstan and the Caspian Sea. Coloured.